•9hrs to Bangkok, followed by 5hrs transit, before the short 3hr final flight to Nepal. With all the “queue time” it was 20 hours from walking into the first queue to leaving the last. •So we get our first view of Everest within those 20 hours too. Well we think it was Everest. Poking out from the clouds at eye level to our plane, it must be. All of a sudden the trip to walk to see it in person seems real. •We’re greeted at the Nepal Airport firstly by a group of customs officers who don’t seem to like the idea that we are carrying 35kg of school supplies to be donated to the Khatrithok School Project. But with luck on our side one of them said we could pass. I’ll never know what the problem was – as soon as he said go, we went, no questions, and no looking back. •The next greeting was much nicer. Arjun from Nature-Treks was there to pick us up. As it turns out he’s one of the great Umbrella success stories. Rescued from an illegitimate orphanage as young boy, Umbrella was able to locate his village and assist him with reintegration and education. He learned a trade as a guide working at Nature-Treks while studying and now is one of their office managers and about to complete his final university exams. Newly married with a small baby boy, he’s got a great outlook and future thanks to Umbrella’s help. •I’ve now been awake so long I’ve lost track of the hours, but at the Hotel we meet Vimal from Nature-Treks who’s also came to personally say hello. We share a coffee/tea and a chat before he puts us in the hands of our trek guide Angtu. What a great guy this one is too. He goes through our trek and equipment check. Because of the weight of our school supplies we didn’t bring much of our own equipment to keep within our baggage allowance, so we did need a few things. Angtu spent the next few hours with us going to the shops he knew to get us the best deal. We got everything we needed for about AUD$55 each! Including down jackets and down sleeping bags! We feel a little bit like idiots for buying anything in Australia first. Of course you’ve got to wear in your hiking boots, but everything else can be bought for so much less. A lot is Nepali Made, so helps the community too. •One last thing to do on day 1. Begin the acclimatisation process, and that includes your stomach! Dinner of Nepali staples, Mo Mo’s and Dahl Baht. Day 1, done. •After a good long sleep, we’re still up early to have breakfast before meeting with Arjun again. We’ve got an early drive to Khatrithok School, to beat the traffic. So if we’ve beaten the traffic I’d hate to see it if we didn’t! We must have averaged 15km/hr at best. It’s amazing to see the landscape change from city to rural and then to mountains. We could see the Himalayas in the distance, but visibility wasn’t great with low cloud and smog. Apparently the views on good days for this journey are spectacular. •We stop at the Sunkoshi Beach Resort, where we need to change vehicles to a 4WD to make the rest of the journey. The resort is a large block of land right on the Sunkoshi river edge, with pet chickens and rabbits freely walking around the gardens. Our room is a very basic two single beds with a shower, sink and toilet with not much room for anything else. But considering it has a shower, a commodity that we will miss out on for the entirety of the trek, the room is the second best room we will be staying in. •So with 6 of us in the 4WD we start the journey. It vaguely looks like a track was there, but just vaguely – definitely a 4WD trip – straight up the side of a mountain with not much room for error at places. Did it worry me that there was a big LCD screen hanging over the rear view mirror playing Napali MTV video clips at full volume? Did it worry me that the other 4 guys were yelling over the songs to talk to each other? Yes! I thought it would be a funny story to tell should we survive so just held on tight through the bumpy ride. •Too much to say about the school to put it all in words. Such lovely kids! Lovely dedicated teachers! It’s hard to imagine as a Westerner how they get by in the conditions they have. Just a handful of small basic classrooms, with no power, for 250 or so students. But the teachers very proudly informed me they rank second in Nepal for grades, and excel at sports. In fact the students were practicing volleyball for their upcoming President’s Cup which they’ve won in the past. •Building has finally recommenced, and was in progress while we were there. Super effort from Linda from The Umbrella Foundation Australia to get that going. The staff were very enthusiastic to let us know how excited they and the students are to have the first stage of building completed in the next couple of months. •Back to the Sunkoshi Beach Resort. And what better to do there, than some kayaking and rafting. Out on the river we go, with ********* a young man working as a rafting guide there, formally of the Khatrithok School. Under his command we paddle upstream to the edge of the rapids. He says if you want to swim jump in, so of course we jump in. So the Sunkoshi river gets quite full in the monsoons from the warm rains. It’s now the dry season, so the river is fed by original source, a melting glacier and snow from Tibet and the Himalayas. If you’ve ever wondered what water from a glacier feels like, the answer is cold! You quickly get to warm up by racing back to the raft as fast as you can swim! •Wake up to a definite chill in the air and cloud covered river and mountains all around us. We could barely see 500m. An al fresco breakfast in the cold was fine as I thought “how’s the serenity”. •Another slow ride back to our Kathmandu hotel. And Arjun asks if we’d like to see the Monkey Temple, as he doesn’t have to start work at the office until 4 he’d like to take us. •So of course, off we go. Thinking we should practice for our trek we walk there. Arjun passes his home and we stop in to drop off his bag and meet his wife and baby boy. 6 months old lying quietly rapped in blankets. Looks just like Arjun. •We continue on, and then hit the temple steps. From the bottom it doesn’t look so bad, there’s a landing not too far up the 45 degree stairs. When you get to the landing you realise you’re only a quarter of the way there as the steps continue on… There’s a lot of steps! At the top you can see the whole of Kathmandu so well worth the walk. The temple at the top is still earthquake damaged and in the middle of repairs, but there’s still plenty to see. •On the way back to the hotel we stop in at Arjun’s old home, the Umbrella Foundation Home. A quick hello there is all. They are currently down to under 30 kids in the home itself, with a vast majority successfully being reintegrated with their villages. Sounds like they are having great success with the program. •We grab a couple of last minute supplies for the trek. Re-pack our backpacks and get things ready for the 4.30am start tomorrow. Early night tonight. Goodnight! •I did a bit of research into the Everest Base Camp Trek. I watched a lot of long YouTube videos to try and get an understanding of what to expect. I won’t say what nationality, but there are lots of video’s describing every single thing as “totally awesome”. Not one of them talked about Altitude Sickness, or the difficulty level of the trek. •The journal of our trek may seem to contain “complaining”… but is a real journal of two Sea-Level-Living Australians travelling out of a 30 degree summer, to the cold Himalayas. One of us is early 20’s and fairly fit, the other is mid (to-late) 40’s, and probably best described as ‘active’ rather than fit. According to our guide we trekked at a medium pace, not fast, not slow. We both pushed ourselves (within our capability) each day as the Altitude seemed to even us up in ability, and we made the uphill trek comfortably in 8 days, and downhill back in 3. We never ran out of daylight, and could have easily not pushed ourselves so hard. We are both fairly competitive and goal driven, so pushing ourselves is in our nature. We saw several older trekkers, and even younger ones who chose to take a gentler pace. With acclimatisation necessary for the altitude you should not try to go up in less than 8 days, and the longer it takes the safer you should be. Having pushed the minimum days, in hind sight we should have added at least one more acclimatisation day to the trek up. 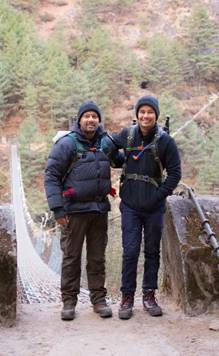 •100% of the trekkers we met along the way had felt some symptoms of the altitude. We suffered from Altitude Sickness, from mild to medium, and on the last day after Base Camp, it got quite bad.. There was at least one occasion where we each thought we may need a helicopter to evacuate us if symptoms got worse, but instead chose not to push the limits and take things slowly and safely. We saw at least 7 or 8 rescue helicopters each day collecting trekkers with Altitude Sickness who either pushed themselves too far, ignored the symptoms, or attempted to trek without a competent guide. Having said all of that, it’s not something to be afraid of, it’s something to be prepared for and research the symptoms..
•The trek is a challenge, and we did not meet one person who said it was easy, but once you get to the end it’s well worth it! •Apparently Lukla is the 10th most dangerous airport in the world. Landing must be super precise as the runway is on top of a mountain at 2840m. So with less air resistance and the runway very short and at a distinct incline it feels like the approach is way too fast. But they must know what they’re doing. Everything went smoothly! •We commence the trek stopping at the village on Monjo about 12km away. It’s actually an elevation of 2835m but we haven’t had a pleasant little stroll down 5m elevation. We go down about 250m and then back up 245, so it’s definitely not a gradual decline. It’s quite challenging for us 40 somethings, even though the 20 somethings make it look easy. •Our porter’s name is Tirtsa. He’s 20 y/o, tiny build, and maybe 160cm tall. He’s about to carry both of our main 2 packs on his head. He’s amazing. 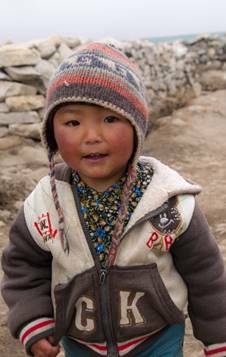 We see Sherpa people of all ages and sizes carrying much more than us, all tied around their foreheads. No cars or motorcycles here, just walking, and carrying whatever you need. 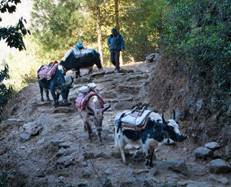 For the heavier loads, donkeys and yaks come and go along the trail carrying everything you can think of. •The first day’s trek is challenging. I wouldn’t say hard, but definitely hard work for me at 47, when I’ve got my 21 year old son to gauge my pace by. We’re feeling the effects of altitude already, loss of appetite and feeling exhausted. Plus we both seem to be a little less on the ball than usual, forgetting what each has said short time ago. •Along the way we meet the local “butcher” (pictured). He’s a guy carrying a basket with a leg of buffalo covered loosely with a cloth (you can see poking up behind him). Angtu tells us it’s illegal for anyone to kill animals anywhere from Lukla up, so the butcher would have brought this from further down, walked a day or two already, and still have another 5 or more days to go before he sells it all along the trek. So:- the further up the mountain you go, the older the meat will be. Lesson 1, don’t eat any meat on the trek, especially on the way up – you don’t want to get sick before you finish. Looks like we’re vegetarians for the next week or so. •We meet several other trekkers. One is a German guy, about 30, but we didn’t get his name. He’s just moved from Germany to Australia (Brisbane) to live with his girlfriend. Her parents don’t use their house because they basically live off their yacht… Anyway, he got his Australian residency, stayed in Brisbane 2 days and now left to travel without his girlfriend. He doesn’t have a return ticket and doesn’t know when he’s going back or even where he’s going next after Nepal. •Today was a long day from 4am, so an early night is had and we’re in bed straight after dinner by 8pm. •We start trekking at about 8am. After a short stroll down hill we start walking up, and up and up. Apart from the river crossing bridges I’m pretty sure it’s ALL UPHILL. A lot of it very steep, so it is quite challenging. Other trekkers going back down tell us that this is probably the hardest day, but it’s still quite achievable. There’s never any rush and you can go at your own pace. Having said that, I struggled today. I’m suffering from a little altitude sickness, so feeling very low on energy, mild headache, and generally not in the mood to trek the hardest day’s trek… Most people will experience a little altitude sickness, but recover as they acclimatise. 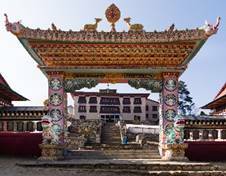 •We walk from Monjo (2835) to Namche (3440m). It’s only about 5km but takes us 3 hours and 15 minutes. When we look down at how low we started it’s hard to believe we made it that high. According to the books we’ve only increased 605m but it feels a lot more. •Most of the trek follows the river Dudh Koshi (translates to Milk River). Angtu says it’s named because of the milky colour it has as it tumbles along continuous rapids. I’m more fascinated by the bright emerald/blue colour it has. In the sunlight, when you’re just at the right height above it, in the deepest parts of the water it has this amazing colour. I’ve never seen a river like it. •We’re really feeling the altitude now, about 65% oxygen here and everything is starting to get physically difficult, and cold! Just to make us feel super-inadequate, as we take a very short break to catch our breath before going up the final steps to Namche, Tirtsa appears from nowhere with our heavy packs and passes us. Can’t believe he beat us today, but I suspect that won’t be the last time that happens. •We hear from trekkers returning from base camp that the temperatures there are as low as -25 degrees. In fear that we’re under-clothed for the next few days we buy a couple of extra things. Shopping in Namche is much dearer than Thamel, so better to plan ahead if there’s a next time. Just to get an idea of the difference, people at a Sherpa Gear shop try to sell us a sleeping bag case for about 3000NPR – that’s three times more than we paid for the actual sleeping bags in Thamel! •It’s a very nice little village here. Very scenic, and it is one of the largest villages in the trek. We have a bit of a walk around town and that’s it, I’m done! Maybe we’ll have a look at something tomorrow… It was a hard day, but satisfying to have done it. •Today is an acclimatisation day for us. So we base ourselves in Namche, with the aim of trekking as high as we’ll go tomorrow and then coming back down to sleep at the lower level. We’re headed to Hotel Everest View (3880m). Up until recently the highest Hotel in the world. •We trek up the mountain behind Namche, to get great views of the village below. There’s quite a bit of snow around, but only on the southern side of trees and walls where the sun doesn’t get to during the day. The mountain wall is very steep here, maybe 60 degrees and we see roaming yaks all along it. Angtu explains yaks are the monkeys of the mountains, they can go anywhere. 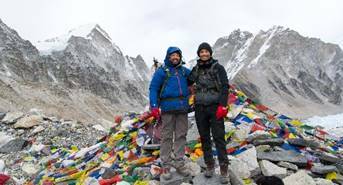 •The trek up to the hotel doesn’t take that long and we stop quickly to enjoy the view of Everest and have some ginger tea. Luckily we have very good visibility today, no clouds at all. •On the way back to Namche we trek to the village of Khumjung. From above we can see a village entirely of green roofs apart from one singe red roof – the Buddhist monastery, with stone walls marking boundaries and paths, it looks like a painting. •Walking back to Namche, Nicholas has the first slip/fall of the trip on loose gravel. Luckily an 8 year old school girl was walking behind him and saved him from properly landing on his arse… He says it doesn’t count as a fall, but I say just because you saved by the small girl doesn’t make it not count. 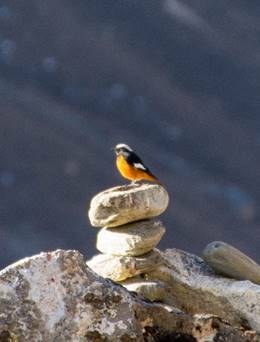 •Today’s trek is from Namche (3440m) to Tyangboche (3870m). We’re quite relieved that it’s only a 300m altitude climb today, and not phased by the immediate climbing. However, after going up maybe 100m, we start descending as the route requires us to cross the river again. We go all the way down to the river side before we then climb back up the other side. We can only guess, but that 300m climb has turned into about 500-600m, and now it’s a full on climb. We’ve become a little acclimatised to the altitude so even though it seems daunting this is much easier than the 2nd day. •We are still amazed by the number of Nepali and Sherpa porters carrying so much weight up these hills. Some are carrying 7 or 8 times the weight we are, maybe more, and they are all passing us up the hills. Not only passing us, but while we are gasping for air, some of them are having full on conversations with each other without a sign of exertion. The range of supplies their carrying is anything from raw meat, other foods, construction materials, and one guy today was carrying a door. I wonder if his wife asked him to whip down to Bunnings to get a new door, and he said, yeah no problem I’ll be back in 2 weeks. •There is so little wildlife at this altitude. Today we are lucky enough to walk past two wild mountain goats, grazing only about 15-20 meters from us. We see many eagles flying overhead. Some of them being annoyed by crows defending their airspace. We never see any of those eagles soar down to catch prey though – a sign that wildlife is few and far between here. About the only other animal we saw was a baby yak on the path, that was kind enough to let us have a pat before it continued down the hill. •Tyangboche is very small village, maybe half a dozen buildings or so, but you have a view of Everest over the closer peaks. The village is famous for it’s Buddhist Monastery, which is by far the biggest building around. We visit for the afternoon prayer session, as the monks chant and pray. Although it’s a slightly different Buddhism than the Sri Lanka Buddhism, it feels like being at the Temple Of The Tooth and spend that time thinking of Sri Lankan family and my father. At the end of the prayers, we’re approached by a very caucasion guy from the non-visitor section. As it turns out he’s a German. He’s been very interested in Buddhism and wanted to come to this Monastery to live with the monks and learn. Strangely enough, he left his job and home, bought a one way ticket to Nepal, and made his way to the village where he simply knocked on the door of the monastery to ask if he could live with them. He didn’t speak a word of Nepalese, so communication was a problem, and they told him to come back at 7am for the morning prayer. He stayed a tea house and came back the next morning, sat through the prayers and then they asked him to leave. He didn’t go but asked if he could help, and they allowed him to do some chores. This went on for the next 10 days until they finally said that he could stay there. He’s been there about a month. 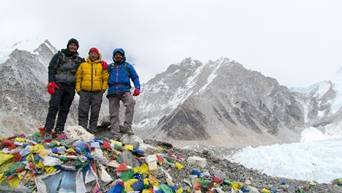 •Tyangboche (4060m) to Dingboche (4310m), where oxygen is at 59%. We wake up to about -3 degrees, and see the sunrise hit Everest with clear blue skies. We start with European Flat, downhill in fact, which we’ve now come to dislike as it only means the uphill will be more severe – possibly Sherpa Flat… Just past the village we find a frozen creek. It’s actually got quite a slope on it, and the water would run quite fast, so it must be cold! •It doesn’t take long before the slightest increase in slope and effort heats you up, and we’re stopping quite regularly to take of a layer of clothing at a time, even though it’s probably 0 or just over. When the sun’s out and hitting you it gets quite warm, but as soon as you go in the shade you feel the cold! The air is so thin, that the sun’s rays penetrate very easily. The sun is so strong here that despite it being below zero temperatures the locals cook using reflector dishes – like a satellite dish but mirrored and a pot to boil in the middle… Tip of the day, remember your sunscreen. •Having passed the 4000m mark we can really feel the altitude affecting our ability. Angtu and Nicholas put me at the front of the line, unfortunately, not to set an example for everyone else to keep up with, but I’ve been having some knee pain the last 2 days, and because I’m the oldest and slowest everyone needs to stay to my pace, so I’m at the front to set the speed. I’m not sure if he’s just being nice or not, but Nicholas says that the pace I’m making is pretty much the pace he would make. Angtu also says we are much faster than the last group he took through here… Anyway, at 4000m we find that things have become more challenging. Flat or downhill is perfectly fine but as soon as you start any sort of incline, even the smallest one, you start losing your breath. I’m talking within 10 steps of incline, even if you’ve just had a long break. It’s quite amazing how a drop of 4-5% oxygen makes such a noticeable difference. •Trees have completely disappeared now. There are sparse small shrubs, but nothing over a meter high. We saw a red robin (as Angtu described it), some crows, and our first spider. The area we trekked today became quite open for the first time. We were crossing open plains as we approached Dingboche. •You can see the clouds forming as high winds lift of the mountain peaks around us, it’s like the mountain has a chimney. When the clouds come in the afternoon to the village you can barely see 50m through them. The Himalayas really are amazing, and it has been worth the hard work and personal challenges to get this far. •Angtu said that if we are feeling 100% tonight we can skip tomorrow’s acclimatisation day. However, having accomplished the last 5 days and passing the 4000m mark, I don’t want to risk altitude sickness. We’ve come so far, pushed ourselves, and earned our way to the finish line. We’ve seen rescue helicopters come and go like a taxi service since Namche – we’re not going to be going home in one of those. •Now I’m not sure if it’s a permanent or temporary thing, but there’s no phone or WiFi access in Dingboche. Hopefully Nicholas can make it through this extra challenge! •Acclimatisation Day. What Angtu calls a “rest day”, All we have to do is trek from Dingboche (4310m) to Chukhung (4750m), and back down. It’s a pretty steady trek, mostly “Nepalese Flat”, but cold. The only thing exposed on our bodies is our eyes. There’s quite a few ice crossings here. Nothing too dangerous, but the ice is very slippery so we need to watch our steps very closely. •We walk along the river that is coming straight off the Chukhung Glacier. For quite a long stretch the river rocks are perfect white, and with snow/ice covered peaks on the other side it would make a great photo.. Unfortunately the glare of the sun at that time won’t allow it. •We do get to see a few robins flying around us, and were lucky enough to stalk a couple down for pictures. The scenery here is quite colourless. There’s a lot of white, black and grey, but the plant life is sort of dull in colour. We’re still in winter so the plants will start to come back to life soon. The birdlife has the only bright colours. •We are really appreciating how hard and challenging this trek is now. Also appreciating what we have at home and how lucky we are. It’s quite nice to doing this in the off-peak season with fewer people around, but the cold is making it difficult for us coming out our Melbourne summer – we’re really feeling the cold. •Nicholas here. It was surprisingly a short day today, but you can really feel the altitude to the extreme. I end up getting to Lobuche with a pretty strong headache, but it’s nothing some paracetamol, ginger tea, and garlic soup won’t fix. The condition of the lodge we stayed at the past two nights at Dingboche was pretty different to what we’re used to, and Dad exclaimed that it’s very likely going to get worse as we keep getting higher to base camp. 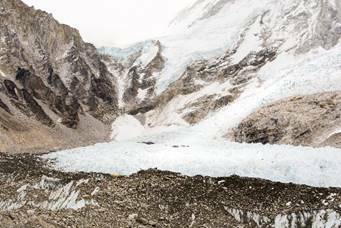 However, we’re in luck when we reach Lobuche, which trumps Dingboche’s quality of facilities! While we keep telling each other that staying at a lodge with only the toilets to squat in will give us an experience we can keep for the rest of our lives, for some strange reason I’m still hoping to see a “Westerner” toilet at Gorak Shep… After a nice dinner, we get ready to settle in to bed for the big day for Everest Base Camp ahead. It’s starting to feel a lot more real that we will actually make it to Everest! •Lobuche (4950m) to Gorak Shep (5164m) and Everest Base Camp (5364m). Weather hasn’t been too kind to us the last day or two, with a fair amount of cloud and poor visibility. So we need to wait to get to Gorak Shep to decide whether or not to go straight to Base Camp, or Kalapathur, which is a small peak with the best views (weather permitting). Although when I say small peak, apparently it is the hardest climb of the entire trek. •Above 5000m you see a dramatic change in the landscape. Trees have long gone, and there are fields of what look like natural bonsai, very short, weather worn shrubs, with thick trunks and branches twisted by the winds. They too soon disappear and it’s almost like being on another planet or moon. Just rocks, dust, ice, and that’s pretty much it. There is a period in the morning after sunrise, before the sun makes the mist rise, where the sky is deep blue and perfectly clear. Unfortunately today is not one of those days and we’re covered in cloud. No sun also means no heat and we arrive at Gorak Shep about midday at -13 degrees. So with no visibility we’re going to head to Base Camp after lunch. From the window it looks so close you could touch it. So off we go, and again we’re going up – we need to climb a ridge and follow that up to probably 5500m, before crossing the Khumbu Glacier and reaching Base Camp. At that height it’s pure and simply “hard”! But after about 2 and a half hours since leaving Gorek Shep, we finally step into Base Camp. A mix of utter exhaustion, having pushed ourselves to the limit for days, temperature of about -15 degrees, and finally completing the goal with my son, makes for an emotional arrival. The feeling of accomplishment can’t be put into words. Neither can how impressed I am with Nicholas, as we’ve needed to co-operate as equals, not father and son, to get through this, and I probably wouldn’t have got through it without him. So the hard work, overcoming various pains, overcoming the affects of altitude, is all well worth it in the end. •I should mention here, at -15 degrees we were both wearing 4 layers of pants, 5 layers of tops, and two layers of gloves. Angtu never seemed to feel the cold (he’s a local to the mountains), and wore a t-shirt for the first two days. For the trek to Base Camp, he finally dug out a pair of gloves from the bottom of his pack and put them in his daypack to wear incase he got cold. Later looking at the photos I noticed he never put them on. When we asked about it, he said he just took them in case it was cold, but it never got cold enough. Amazing…! •Back to Gorak Shep with a plan of a pre-dawn summit of Kalapathur the following morning. Unfortunately, we are both suffering from Altitude Sickness on our return from Base Camp. Severe headaches, no appetite (unable to even force ourselves to eat), and starting to feel nauseous. We’ve reached our limit, and we make the decision it’s not worth risking a higher climb in the morning. It’s time to go back down. We’ve achieved our goal. We both wake up in the middle of the night with throbbing headaches, so it’s good that we didn’t risk the trek to Kalapathur – it could have been fatal. 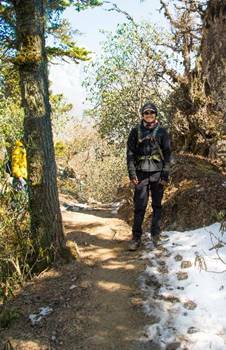 •Descent from Gorak Shep (5164m) to Pangboche (3985m). We cover so much ground in descent in one day. What took us 3 days to cover going up, we see in one full day of descent. The slow change in landscape seems very fast. From another planet/moon of rock and ice, to natural bonsai fields, to green trees, all in the space of a day. •We stop at Tengboche, which is about half way and we can see where we’ve come from and where we should finish for the day. It’s incredible to see the vast distance we’re covering by foot, and the hills that we’re climbing up and down. •We cover so much ground we drop elevation by just under 1900m and can feel the altitude symptoms disappear as we go. By the time we have dinner we can actually finish the small meal we order. The last few mouthfuls are forced, but still we finish. •The best sleep so far at night. We’re now acclimatised and the extra oxygen is making us feel revived. •Pangboche to Namche. Everything now seems so green and so warm compared to the last few days. Even though it’s only a few degrees above zero, the warmth is incredible as we can still feel the -15 of the days before. •Coming down-hill more than we’re going up hill, we can both feel the extra stress in our knees at the end of the day. The descent days still have quite a bit of “Sherpa Flat” to climb, and by the end of the day we are exhausted. We are covering so much ground descending, the days are quite long. •Today is quite a hard day even going down, as it involves a heap of descending at the start followed by a heap of ascending again. About 2 hours down and 2 ½ hours up. However, it’s so much easier now that our bodies are used to such a low amount of oxygen. We finally hit Namche after about six hours of walking, and we do a bit of shopping before having dinner. Looking at souvenirs in Namche shows just how huge the price difference is between the main city and the mountains. It costs about USD$10 for a handmade Tibetan singing bowl made in Nepal when shopping in Thamel, but a local tries to sell us the same bowls for USD$35 per bowl! •It’s only been 11 days since we started, but we can see the landscape has changed as winter comes to an end. The first flowers for the season have come out (they weren’t there when we started), and everything is so much greener around us. •The last half hour into Lukla is “Sherpa Flat” again. It’s been a long day again, and that last step up as we enter the village is such a relief. We’ve made it safely to base camp and back! •The last two days we’ve seen 17 rescue helicopters come in, and this is the off-season. We’re glad we didn’t push ourselves over the edge, but also glad we pushed ourselves each day to achieve our goal. We’ve done it, and feel very proud of each other. Neither of us think we could have done it on our own without the other one’s support and company. It’s amazing how much of a difference the presence of a family member/friend can have on your motivation. •We wake up to find the area covered in cloud. So thick that all aircraft (planes and even rescue helicopters) are grounded. •It stays that way for two days. •Getting a helicopter is organised chaos. They seat 6 passengers so it’s up to us to try and find another 4 trekkers willing to pay to leave. You can’t order a flight until you have all 6 seats filled, so it’s a mad rush to find 4 strangers to each put up the US$300 for the flight. •We literally work for 5 hours getting people together, as so many people change their minds or are in groups too large or small to fit one flight. Eventually we get a group together, pay the “helicopter manager” and order a flight. We’ve got about an hour until we run out of daylight so wait impatiently at the helipad for ours to arrive. 15min to go and the “helicopter manager” says that the flight has been cancelled. Angtu says that probably means it’s been sold to higher paying customers… We’ve missed our chance, and the very last rescue helicopter is about to depart to collect a patient. •In one last desperate effort, as the rescue pilot steps out, we shamelessly beg to be taken back with him after the rescue. He says it will be no problem, as he has a maximum of three rescues up the mountain, and by this stage there are only 3 of desperately waiting. He has to come back to refuel before heading to Kathmandu so will pick us up then. •45min later as the sun is just about to set and flights stop, the helicopter returns with only one rescue patient on board sitting in the front seat. The whole back is free and there’s more than enough room for the 3 of us. We stand at the helicopter door with our bags as the crew refuel, waiting for them to finish so we can open the door and jump in. It’s such a relief to be going, to get out of the cold, and back to Kathmandu. The Pilot gives us the thumbs up, then a halt sign, then starts to talk to the passenger inside – he quickly changes to a thumbs down and then takes off without warning. Scratching out heads we ask the ground crew what happened. •There was a quite a bit of swearing at that point, and then finally we faced the fact that we have at least one more night in Lukla and skulked back to the teahouse fuming. He wouldn’t have even noticed us in the back seat! What sort of a person says no leave them behind. •6.30am after sunrise, and the cloud has lifted quite a bit. A string of about 6 planes arrive from various airlines, and we’re booked for the second round of flights if they fly. As soon as they depart we can see the cloud coming in. It should only take an hour for them to return for the second round, so we check in, and despite being strict atheists, it seems we’re all doing some sort of praying…. The cloud comes in, the hour comes and goes. Another hour comes and goes, and we get a report that now the Kathmandu weather is too cloudy to take off. Another hour, and again we start thinking we should try and gather 6 people for a helicopter before it’s too late for that too. Then suddenly the sound of a plane engine and it’s our company. Our flight is here! You’ve never seen all passengers get in a buckled in so quickly, willing the pilot to take off before any more cloud comes in. Then he does, we’re in the air and after 4 days we’ve made it out of Lukla. Well have just enough time to get some laundry done in Kathmandu so we can finally shower and change into clean clothes for the first time in 2 weeks. 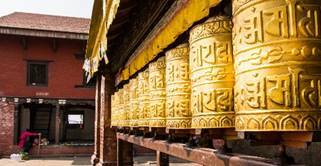 One ore day and we would have missed our return flights home from Kathmandu – what a relief!!! •In hind-sight the hiking boots were the only essential, as these need to be worn in before you start. 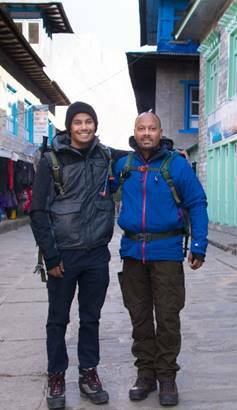 •Upon arrival Angtu ran through a list of supplies needed, and then took us to the trekking shops he uses. There are 3 types in Nepal: “Cheap” and unreliable; “Okay” and good enough to last at least one trek (many if you’re lucky); and “Sherpa Quality”, expensive and long lasting. •We decided on “Okay”, not knowing if trekking was going to be a life long past time or not – this was our first trek and could quite possibly be our last. We seriously should have only bought hiking boots in advance. 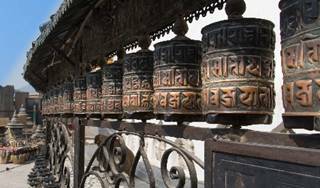 Everything is so cheap, the quality is quite good, and with the help of a good guide, you can select the right quality from the locally Nepal-Made items. We spent about US$60 each and bought everything else we needed. We even got -20 rated feather sleeping bags and feather jackets included in that – although these were ex-hire items, a good wash and they were as good as new. You also have the option of hiring feather items for about US$0.50 per day ($14.00 for the whole trek, for both sleeping bag and jacket). I reckon if you have your hiking boots, and nothing else, not even a pack, or daypack, you could fully kit yourself out in Nepal for about US$100. •The only extra thing to consider here is that Angtu (like most of the guides), was born and raised in the Himalayas. He’s used to the cold. As I mentioned he didn’t even wear gloves when it was -15 degrees… Take that into account with your own home weather acclimatisation. On average we needed at least one extra layer than Angtu thought necessary. Check the weather forecast for Lukla, Namche and Gorak Shep before you start shopping to get an idea of how cold it will be at the time of your trek. The best thing we bought was probably our ‘soft shell’ hiking pants – comfortable, warm and flexible. We didn’t buy these until Namche, unfortunately, thinking a cargo style hiking pant would be more useful. They had lots of pockets for stuff, but were a bit restrictive with movement. •Take a 3 litre hydration pack in your day pack, and a packet or two of water purification tablets. This will get you though most days, and you can always refill along the way. You can buy plastic bottles of water everywhere along the way, but Nepal doesn’t really have an effective rubbish/recycling program and purification tablets are much better for the environment. You’ll find bottled water gets quite expensive the further up the mountain you go too, as with everything. Filling up your 3L bladder with water at tea houses or on the way, on the other hand, is free if you ask nicely. •If you think that you’ll be religiously using hiking poles and will want to take them home with you, it might be a good idea to invest a little more in them. We paid about USD$5 each for a cheap pair, and mine lasted the entire trek whereas Nicholas’ broke after the first day of use. He ended up spending about USD$30 on a new pair that he said worked and felt great. We gave my pair and his broken pair to Angtu for him and his family, but Nicholas kept the good pair in case anyone needs it at home.